Mold is an elusive and often misunderstood problem for homeowners and even business owners. The average person isn’t always the most educated on mold and there exists a lot of misinformation out there. Mold is everywhere and affects more people than you may believe. Here are some basic facts you should know to protect yourself and your property from the threat of mold spores in Houston, Texas. Probably the most common misconception about mold is that it is easily eradicated with bleach. This is not true! Mold will typically grow back within a matter of weeks when wiped away with bleach. Even worse, if you try to kill mold with bleach on walls, the mold will recede into the pores of the wood in the walls and behind the paint and then regrow later! Mold can grow through paint, even through mold resistant paint or those that claim they can kill mold. Mold is often deeper than what can be seen with the naked eye, so paint will not get rid of it. Over time, the paint will begin to crack and bubble and the mold will return with just as much strength as before. Mold always has an underlying cause. Somewhere there is an intrusion of excess moisture, even if you can’t tell exactly where. It could be a leak or an improperly sealed window that is causing rainwater to seep inside. It could have been a flood from the previous homeowner or a simple hose drip. Remember, anytime you see mold, it is crucial that you get rid of it immediately. If you don’t want it coming back, you’ll need to find the source of the water damage and repair that as well. Not all species of mold are harmful, but it can be extremely difficult for the average person to know which are beneficial and which are harmful for humans. 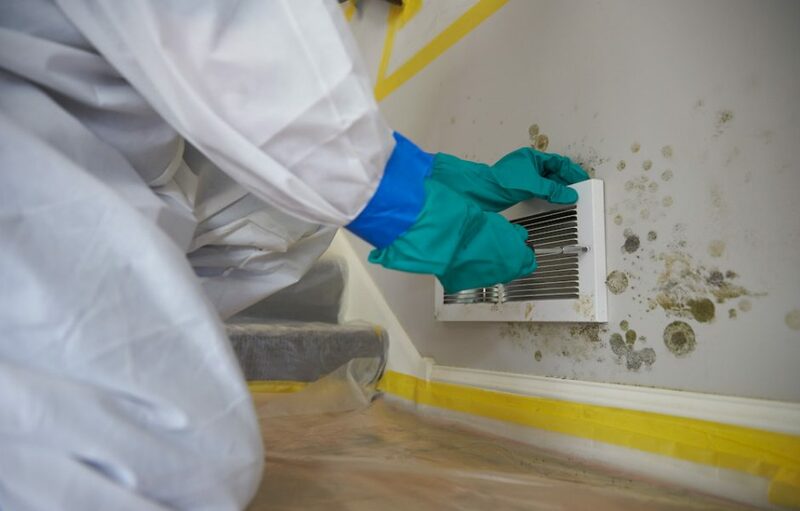 It’s always a good idea to have a professional come and assess the mold damage to ensure it isn’t one of the very toxic forms of mold that can make you ill or worse, be fatal. Mold can cause health issues anywhere from mild allergy irritants to death. Respiratory issues, skin rashes and even reproductive issues can be linked to mold exposure. Most commonly reported are cold and flu-like symptoms, sinus infections and headaches. It can get more serious though. Long-term exposure to mold can lead to pregnancy miscarriages and death in the young, elderly or immune compromised. Always check with your insurance agent or homeowner’s policy to know whether you are protected against mold. Typical insurance policies don’t cover mold damage or flood damage. You may need to purchase a separate policy or be prepared to pay out of pocket for remediation services. Know the basics of mold damage and mold remediation so you can protect yourself from the risks on both your health and your property. Should you ever need mold remediation or assessment services, ServiceMaster Advantage can help in the greater Houston area. Call or contact us today!